A truly terrible result for UKIP. 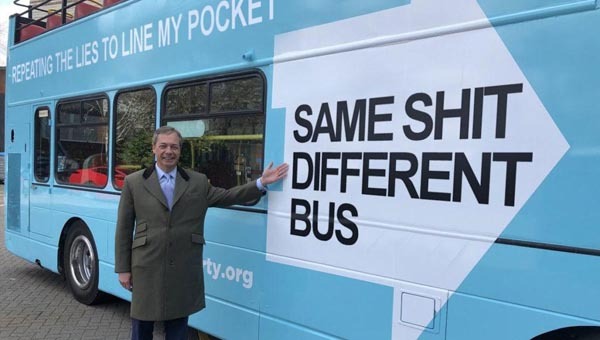 And yet the Farage sycophants seem to think that a pathetic 1.31% increase in the vote, losing your deposit and coming fifth behind the Lib Dems - the party that Farage claimed UKIP had replaced as Britain's third party - is cause for celebration! It is interesting to note that the usual sycophants were claiming that UKIP would come third with a substantial increase in the vote. How foolish must they feel now! And what a tragedy for Britain that the odious Galloway has been returned to Westminster! UKIP will never send an MP to Westminster under Farage. UKIP exists to keep Nigel and his sycophants on the EU Gravy Train. It exists to serve his vanity and increase the size of his bank balance at the expense of party members and the UK taxpayer. To be fair she did nearly as well as Nigel Farage did in the General Election - though like Nigel Farage coming third in a one horse race in Buckinghamshire, without Labour or LibDim participation Ms. McNally's achievement at such a time in the electoral cycle was a cringeworthy achievement sadly on a par with UKIP under its present utterly unprofessional and incompetent leadership. May I congratulate Junius for finding the enthusiasm to even report on this embarrassing result - so redolent of UKIP achievements in any or all domestic elections! It is hard to expect a leopard to change its spots - though as a money making scam politics has clearly proved far more profitable than his earlier antics as a gambler in 'The City' where even then alcohol and libido were his consistent undoing! It is quite clear from actual results rather than often fanciful polls that UKIP is unlikely ever to have any relevance in domestic politics and the unprofessional back stabbing, squabbling and self seeking of its leadership clique and the claque of wannabes has ensured no one is ever likely to take them any more seriously as a political force to Leave-The-EU than they do in their dedication to reverse smoking & health laws, drug policies, speed cameras, waning public interest in pubs and the other fripperies where it seems to be the only place that UKIP can gain any traction as a farce to be reckoned with. Many UKIP supporters, like myself, will be equally sad to see the continued demise of what had been a great hope for Britain - it is sad they just drifted away and did not stand their ground to speak out as a small handful of us have - had those who lefty in disgust remained as we do perhaps speaking out might have changed the party adequately to give it relevance but as will be noted from the reduction in interest on my blog and in various desperate little forums UKIP is clearly seen increasingly as irelevant - a position taken by the media a considerable time ago. It is just a meager hope that keeps a few of us posting in the hope of change and mature professionalisation of the hopelessly corrupt and ethically retarded UKIP. "These new figures underline a new reality in British politics, a reality that will be highlighted in [the] Bradford by-election, there are four parties, and one of them is on the up." I nearly wept when I read this.